ROGERS, ALBERT BOWMAN, civil engineer; b. 28 May 1829 at Orleans, Mass., son of Zoar Rogers and Phebe S. Kenrich; m. first in 1857 Sarah Lawton (d. 1858) of New York; m. secondly Nellie Brush of Iowa; d. 4 May 1889 at Waterville, Minn.
As a young man, Albert Bowman Rogers was apprenticed to a ship’s carpenter, but made one sea voyage only. He entered the engineering faculty at Brown University in 1851 and after transferring to Yale the next year obtained his bachelor’s degree in 1853. Following graduation he was employed as an engineer on the Erie Canal, before moving to Iowa and then to Minnesota. In 1862 he was commissioned major in the United States cavalry by the governor of Minnesota, Alexander Ramsey, during the uprising of the Dakota Sioux. The year before, he had joined the engineering staff of the Chicago, Milwaukee and St Paul Railroad where he gained the name of the “The Railway Pathfinder” for his location work. This brought him to the attention of James Jerome Hill* of St Paul, a member of the executive committee of the Canadian Pacific Railway. 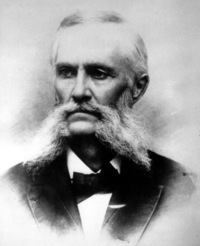 Hill hired him in late February 1881 to take charge of all mountain location work for the company. Rogers’ main task was to find and locate two passes, through the Rockies and the Selkirk Mountains, which would provide the CPR with a direct route to the Pacific. In April he dispatched survey parties to work their way up the Bow River from Fort Calgary and explore both the Howse and the Kicking Horse passes in the Rockies. Rogers intended to tackle the Selkirks himself, since it was generally held that no pass existed through those mountains. He had studied the report of Walter Moberly, a British Columbia government engineer who, in 1866, had sent one of his men up the west slope of the mountains along the route of the Illecillewaet River in the hope of finding a pass. The trip proved abortive; Moberly did not believe a pass existed. 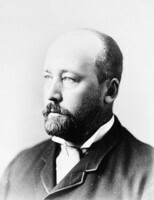 But Rogers, together with his nephew Albert and a party of Kamloops Indians, followed the same route to the summit of what was later named Mount Sir Donald. From this vantage point, in late June 1881, Rogers thought he saw a way through the barrier. He could not be certain because he had run out of supplies and was not able to explore the intervening 18 miles. None the less, he reported, in his enthusiasm, that a practicable route existed. In the summer of 1881 Rogers located the line through the Kicking Horse Pass. The following May he again attacked the Selkirks, this time approaching from the east by way of the Beaver River at its junction with the Columbia. Again he ran out of supplies and was forced to turn back. On 17 July he tried again, following the Beaver and its tributary the Bear to reach, at last, the same mountain-ringed meadow he had observed from the slopes of Mount Sir Donald the previous June. Henceforth, this would be known as Rogers Pass. The date was 24 July 1882. Hill swore by Rogers and when the CPR was completed in 1885 (Rogers was present at the driving of the last spike at Craigellachie), Hill hired him as a locating engineer on his Great Northern Railroad. Rogers’ career ended when, at work for Hill in the Cœur d’Alene Mountains of Idaho in 1887, he was badly injured falling from his horse. He died two years later at the home of his brother in Waterville, Minn., after a long and painful illness from cancer of the stomach. Canadian Pacific Arch. (Montreal), Letters from A. B. Rogers. 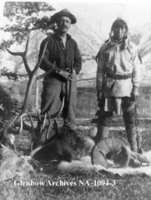 Glenbow-Alberta Institute, T. E. Wilson and W. E. Round, “The last of the pathfinders” (1929); pub. as Trail blazer of the Canadian Rockies, ed. H. A. Dempsey (Calgary, 1972). Minnesota Hist. Soc. (St Paul), Cannon River Improvement Company papers; Scrapbooks, 2. PABC, Add. mss 767, Marcus Smith to Joseph Hunter, 23 Feb. 1885. PAC, MG 28, III20, 1, C. Van Horne letterbook, no.1: 234–40; 2, C. Van Horne letterbook, no.7: 483–85. B.C., Lands and Works Dept., Columbia River exploration, 1865–6: instructions, reports, & journals . . . (2v. in 1, Victoria, 1866–69), II: 15. A. L. Rogers, “Major A. B. Rogers’ first expedition up the Illecillewaet valley, in 1881, accompanied by his nephew, A. L. Rogers: an account of the trip,” A. O. Wheeler, The Selkirk range (2v., Ottawa, 1905), I: 417–23. 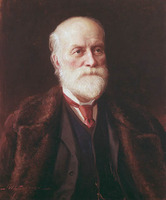 G. M. Grant, “The C.P.R. by the Kicking Horse Pass and the Selkirks – X: the Rogers’ Pass,” Week (Toronto), 1 May 1884. Winnipeg Daily Times, 23 Jan. 1882. Obituary record of graduates of Yale University deceased from June, 1880, to June, 1890 . . . (New Haven, Conn., 1890), 535–36. Pierre Berton, The national dream: the great railway, 1871–1881 (Toronto and Montreal, 1970); The last spike: the great railway, 1881–1885 (Toronto and Montreal, 1971). J. M. Gibbon, Steel of empire: the romantic history of the Canadian Pacific, the northwest passage of today (Toronto, 1935). J. H. E. Secretan, Canada’s great highway: from the first stake to the last spike (London and Ottawa, 1924). J. F. Stevens, An engineer’s recollections (New York, 1936); repr. from Engineering News-Record (New York), 114 (January–June 1935)–115 (July–December 1935). B. A. McKelvie, “They routed the Rockies! Railway pathfinders forged steel links from east with west,” Vancouver Daily Province, 3 Feb. 1945, magazine section. C. Æ. Shaw, “A ‘prairie gopher’ makes reply,” Vancouver Daily Province, 27 Oct. 1934, magazine section. Pierre Berton, “ROGERS, ALBERT BOWMAN,” in Dictionary of Canadian Biography, vol. 11, University of Toronto/Université Laval, 2003–, accessed April 24, 2019, http://www.biographi.ca/en/bio/rogers_albert_bowman_11E.html.